Students Take the Lead in "A Walk For Water"
Plans for “A Walk for Water” in the Washington D.C. metro area are underway. Henson Valley Montessori, Barrie School, Oneness-Family School, Boyd School and Aidan Montessori have become the coordinating schools for the event on May 17th. Students will walk 3.25 miles around Lake Frank near Rockville, Maryland, through wooded trails and over a shallow stream, in support of the people of the Azawak who travel 10 times that distance in a day just to bring home a little water. Their collection of sponsorship money for every mile walked will go toward building the next borehole in the Azawak of Niger in West Africa, giving up to 25,000 more people and animals access to clean water. The students are taking the lead within their own school communities and in local Montessori schools to invite their peers to participate by conducting letter-writing campaigns. We feel obliged to spread the word about the arid Azawak Valley. It is a desert area the size of Florida mostly in Niger, West Africa. The Azawak is rather desolate; the rainy season is getting shorter every year. All attempts to grow crops end in failure. Many children die before the age of five, and many little girls travel thirty miles or more just to bring back water to their families. The people who live there, Tuareg and Woodabe Fulani ethnics, have been ignored not only by their government but by the rest of the world. However, things are changing. A new organization, Amman Imman: Water is Life, has risen to the occasion. With the help of school children around the world, mostly Montessori students, last year Amman Imman raised enough funds to build a permanent well in the Azawak. Many more are needed. We are continuing to help Amman Imman raise money and spread the word about the Azawak in order to build the next well. We hope you will join our mission to help the people of the Azawak. 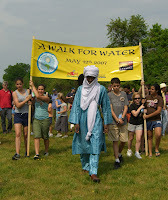 Our school is helping to organize the 2nd annual “A Walk For Water, a walk for children by children” which will take place on May 17, 2008. We will be walking 3.25 miles around Lake Frank in Maryland, a fraction of the miles that the children of the Azawak have to walk to get water. However, we hope that by walking together we can not only raise funds, but bring awareness of their terrible plight to the rest of the world. We invite you to join us. Please see the enclosed flyers for more details. A growing number of schools are responding to the call for collaboration. The students are now in the process of following up the letters with phone calls to find out which schools would like a presentation about Amman Imman and which schools plan to join in for “A Walk For Water”. Meanwhile, the registration for "A Walk For Water" has begun with students heading up the drives within their schools. 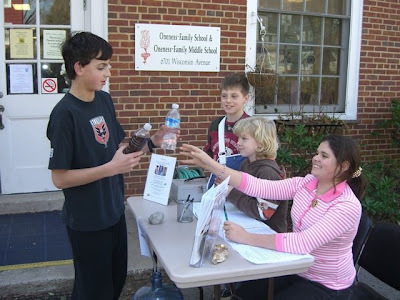 as Jacob and Andrea sit behind the registration table for "A Walk For Water". We invite you to initiate "A Walk For Water" in your own community! Download a flyer, registration form and sponsorship sheet that can be edited for your own "A Walk For Water". Also, download an Information Sheet and Frequently Asked Questions pertaining to "A Walk For Water" in Maryland. Specific guidelines, including parking information, will soon be available.